If you saw what happened at the end of Smallville tonight then you might think, was that Granny Goodness? the woman in charge of the furies on Apocolyps. 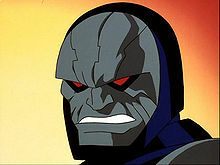 Darkseid is one of the darkest charecters in the DC Universe, and would be a great way to begin the final season next year. coming to Smallville?? | Radio of Horror Blog” on my very own blog.